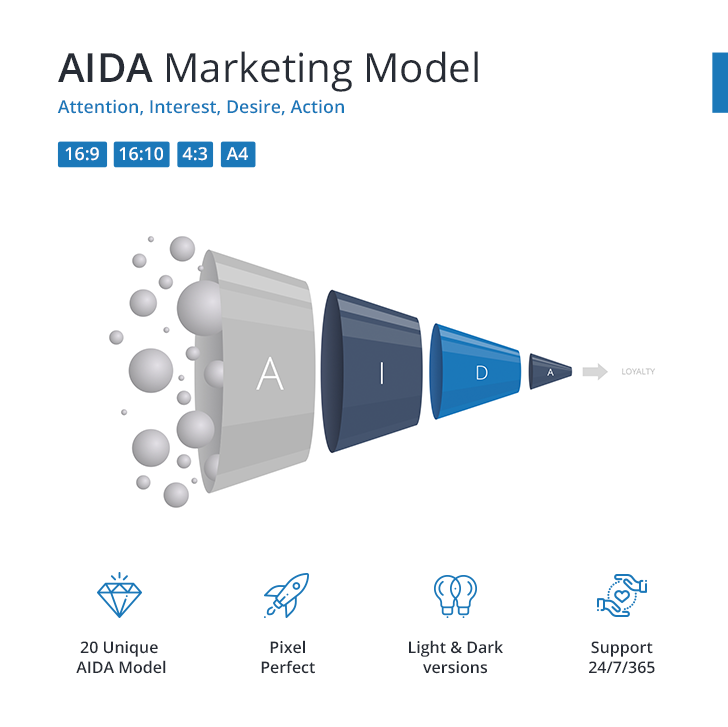 AIDA model (marketing) for Keynote - Download Now! 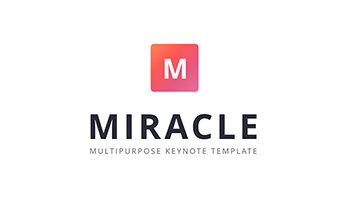 This page is devoted to our new template designed for Keynote users. The sample is available for new Keynote versions. 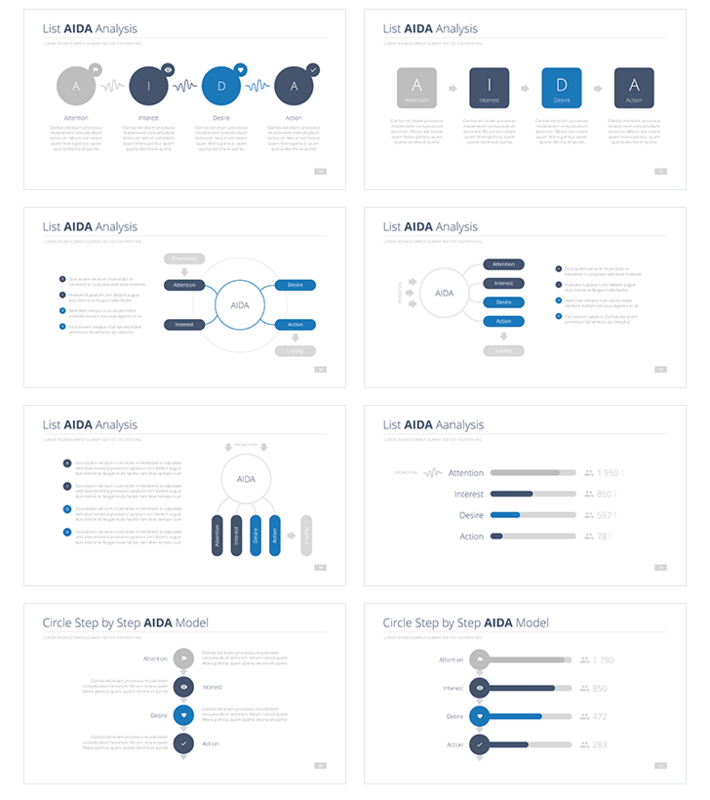 It consists of 20 unique slides with various types of AIDA analysis. AIDA is an acronym for Attention, Interest, Desire, Action. It is a marketing model of consumer behavior adopted in American practice, describing the sequence of events leading to the decision to purchase: therefore, first comes Attention (a potential consumer finds out the product) → then Interest (heshe shows interest towards the product by learning about it) → Desire (has a favorable position) → and finally comes Action (make a purchase, buy the product). It is used while forming sales strategies, preparing trade dealers, managers, advertising. 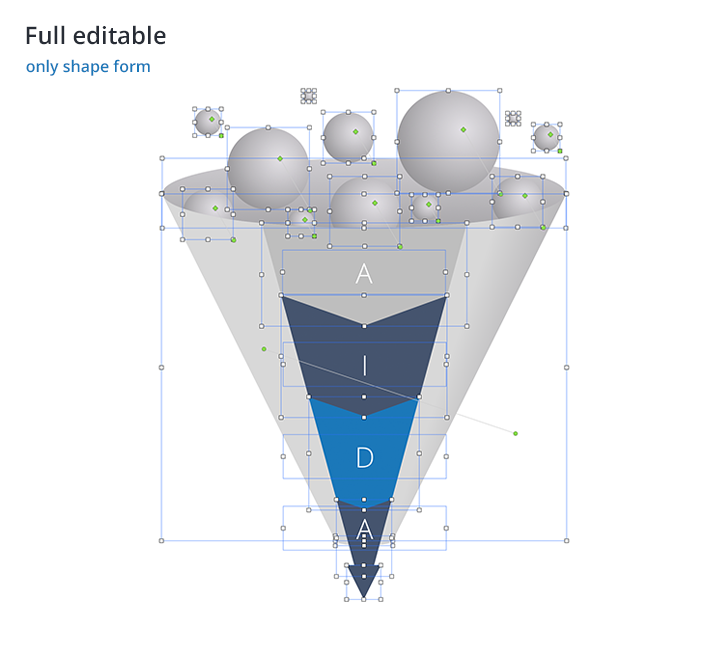 As it is shown, the template has a modern design with various diagrams. 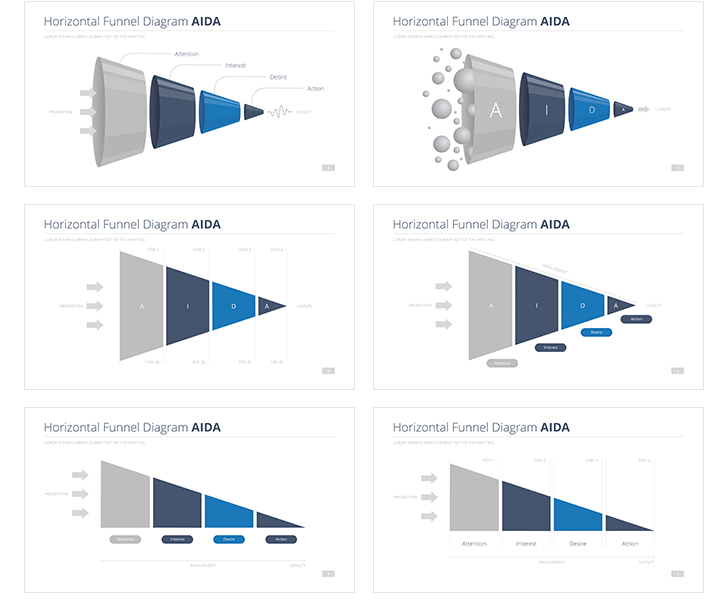 Thus, there are Horizontal Funnel Diagrams with its modifications, Funnel Models, List Analysis, Circle Step Models. The template can be easily changed in two clicks. Every part of it is fully editable. 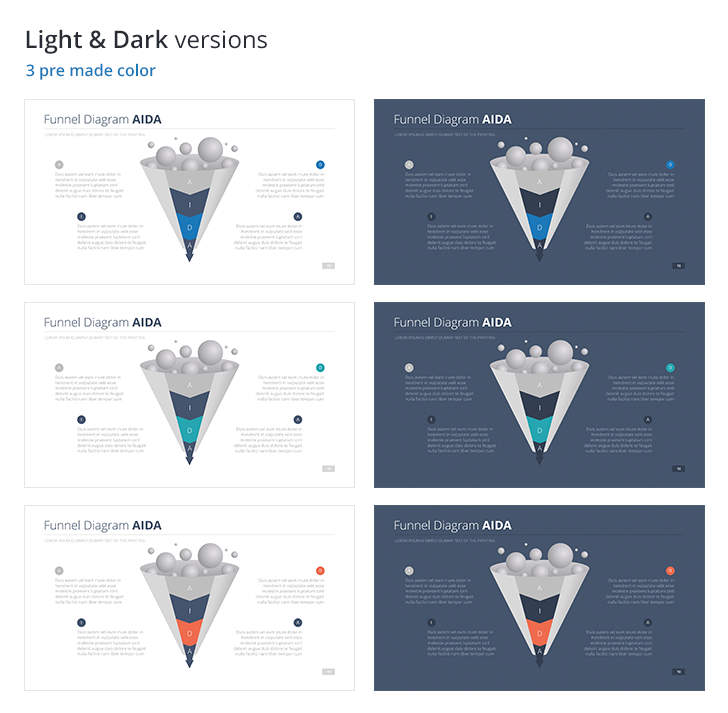 Therefore, you will be able to change colors to what you want and need, add effects, gradient and make everything to your taste, work with icons, etc. If you change the size, the template remains its excellent quality. 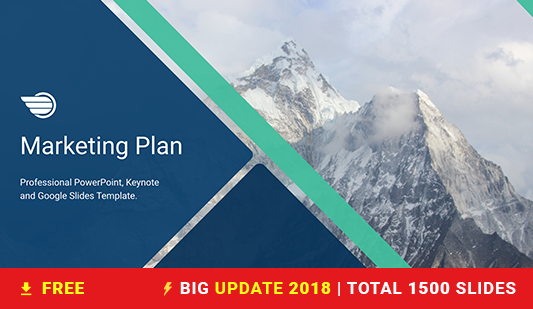 Demonstrating it on the displays with any resolutions, your presentations won’t seem worse. 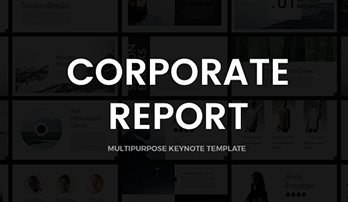 The template is available in 4:3, 16:9, 16:10, A4 Aspect Ratio. If you need, you can print it on your office printer without worries about quality. For our clients, we provide 247365 Support. Our team will be glad to answer your questions. 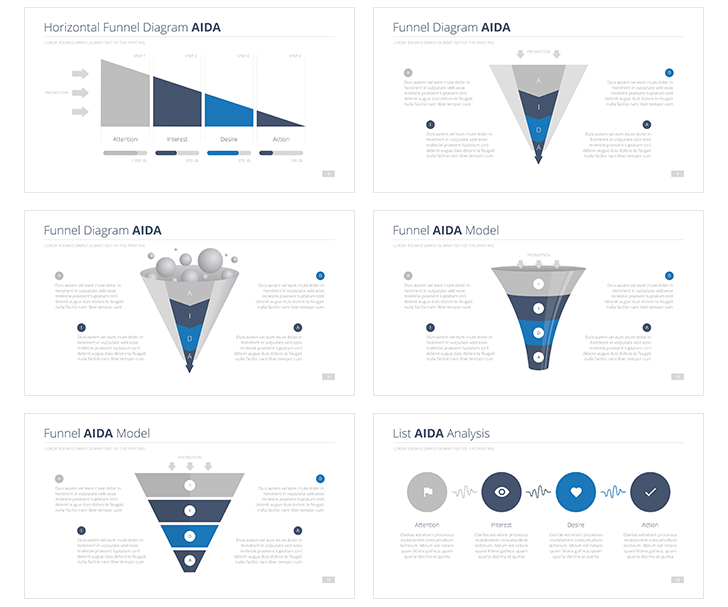 As the AIDA model is widely used in advertising and marketing, the AIDA template will come popular for similar fields. Managers and advertisers and others employees of adjacent professions will appreciate it.